Sub: Scheme for compassionate appointment – Relative merit points and revised procedure for selection. The undersigned is directed to say that the Department of Personnel & Training under the Ministry of Personnel, Public Grievances and Pensions is the nodal department for Government of India’s Scheme for Compassionate Appointments. While considering requests for compassionate appointment, a balanced and objective assessment of financial condition of the families of the applicants has to be made taking into account the assets and liabilities and other relevant factors. The main object of the Scheme is to alleviate the family of the deceased government servant/member of the Armed Forces from indigence and help it get over the emergency. Accordingly, vide Ministry of Defence I.D. No.271/93/D(Lab) dated 2.11.93, Ministry of Defence had developed a 100-point weightage system containing various parameters/attributes to decide the most deserving cases amongst the large number of applicants. The weightage system was revised in 2001 vide Ministry of Defence ID No. 19(4)/824-99/1998-D(Lab) dated 9.3.2001. Consequent upon implementation of the 6th CPC Report, parameters of all these attributes were further revised in 2010 vide MoD note No.19(3)/2009/D(Lab) dated 22.1.2010 and 14.5.2010. Presently, the attributes on 100-point scale are – Quantum of Family Pension (20 points); Terminal Benefits (10 points); Monthly income of family from other sources (05 points); Movable/immovable property held by the family (10 points); No. of dependents (15 points), No. of unmarried daughters (15 points); No. of minor children (15 points) and Left over service (10 points). As per the practice, compassionate appointment is given to the highest score earner. 2. Now, consequent. upon implementation of the 7th CPC pay structure, the financial parameters are required to be revised again. Certain organisations/ formations under Ministry of Defence have been requesting for revision of relative merit points and procedure for selecting the most indigent applicant(s) for compassionate appointment after death/medically boarding- out of the Government servant/member of the Armed Forces on whose income the family was wholly dependent. 3. 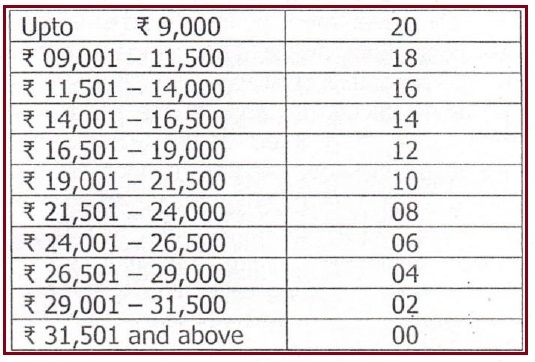 As per 7th CPC structure, the minimum pension stands revised from if 3,500 pm. 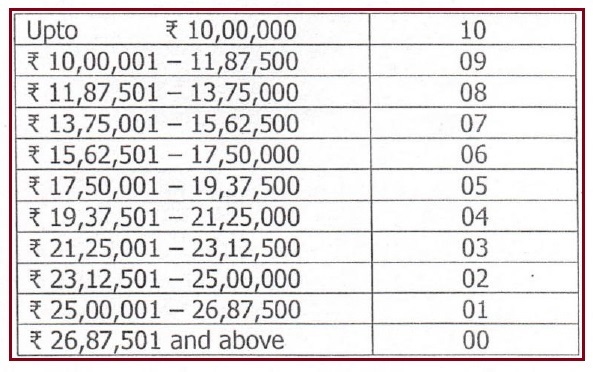 (as per 6th CPC) to 1 9,000 p.m. which approximately comes out to be 2.57 times the old pension. The Govt. of India have also approved this factor of 2.57 for working oUt revised pay, based on which DCRG, Family Pension and Leave encashment are calculated. Accordingly, the monetary parameters/attributes such as Family Pension, Terminal Benefits, Monthly income of earning member(s) and income from property and latest market value of the Movable/Immovable property have been revised by the multiplying the fitment factor of 2.57 or so, for arriving at the present-day weightage points. However, other non-monetary parameters/attributes viz. No. of Dependents, No. of Unmarried Daughters, No. of Minor Children and Leftover Service have been kept unchanged. (b) Lump sum amount received by the family on death of Govt. servant (i.e. DCR Gratuity, GPF/PPF A/c balance, Leave Encashment, CGEGIS, LIC/PLI etc.) Lump sum Amount received under NPS etc. 5. The revised guidelines will take place with immediate effect. However, cases already considered by the Boards of Officers constituted for considering requests for compassionate appointment as per the previous guidelines need not be re-opened. (c) For cases where death of the deceased Govt. servant occurred on or after 22.1.2010 till 31.12.2015, parameters of ‘Terminal Benefits’ given in MoD ID note dated 22.1.2010 will be applicable. 7. All the concerned are advised to strictly follow these weightage points and guidelines keeping in view the instructions issued by the DoP&T/MoD, from time to time for assessing comparative merit of the applicants for compassionate appointment.